At Banff-Holidays.com, we are here to plan your holiday to make sure you make the most of your time here, in Banff. We can create a package for your ski, snowboard or year-round holiday, or vacation, at a very competitive price! 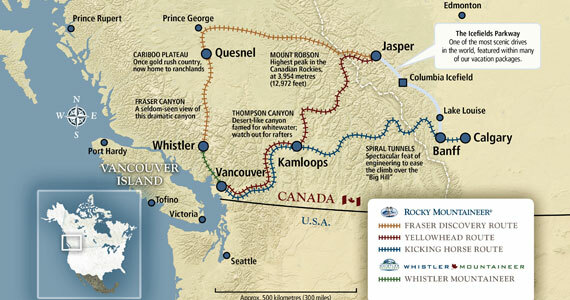 For all Rocky Mountaineer Train Holiday packages click on the map above. Private or scheduled transfers Let us do all the planning! Flights to Calgary Whether you are flying to or from Calgary, we can find you the best rates through our selected airlines. Banff Car rental We use all the major car rental compaines including Avis and Thrifty. Book early to avoid dissapointment! Make sure you book your ice hockey tickets in advance to see the Calgary Flames. Return transportation from Banff and Canmore included. Visit our Banff Blog for exciting news, deals and specials. The Eye on Banff shows the LIVE webcam image of the Town of Banff, with Cascade Mountain in the background. Provided courtesy of Banff Gondola.